After finishing runners up in their group to Madrid – knocking out Liverpool along the way – Basel face Porto in the first round of the Champions League knockout stages. Porto reach this stage after winning their group, which included Shakhtar Donetsk and Athletic Bilbao. A good game overall, with some good defensive work from Basel to prevent Porto fully utilising the skills of their great dribbling players. Porto begin with: Fabiano in goal, Maicon and Marcano centre backs, Danilo and Sandro s the fullbacks (with interesting roles during combinations in wide areas), Casemiro in the 6 position, Herrera and Torres as the 8’s (also used in combinations in wide areas), and Tello, Martinez and Brahimi as the front three. 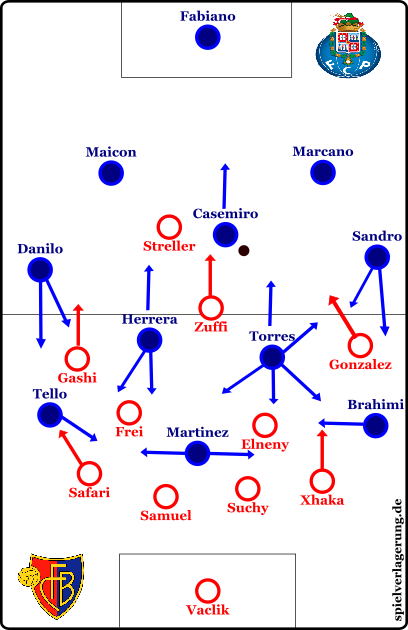 The strategy of Porto was to initially stretch Basel vertically, then use the open spaces for creating overloads in wide areas. They did this by building up short to attract Basle to press, circulate the ball from one side to the other and then look to play forward from the fullbacks to the wingers, who could then lay off and combine with the 8’s positioned in-between the Basel midfield and defensive lines. In their build up, the Porto centre backs split wide, the fullback move up in line with Casemiro and one of Herrera or Torres situationally dropping back next to Casemiro to help in building and offer greater stability. The wingers started wide, with different dynamics on each side. Martinez played a smaller role in the possession phase, with mostly horizontal movements or playing on the last defender. On the left, they would have inside movements from Brahimi (receiving from either Sandro or Torres after moving deep to collect the ball), Sandro moving up wide and Torres deeper in the left half-space. This lead to some combinations and rotations on the left as they then moved into creation areas, but they struggled to find penetration with the man marking from the Basel players. On the right Tello stayed wide and his movements were either dribbling with the ball or runs behind the fullback. Herrera would look to make well timed runs into the half-space, behind Frei, upon Tello receiving the ball wide to either receive or to create space for the Danilo to receive the ball deeper in the half-space, which would lead to early crosses. They created some good situations with Tello drawing Safari out of position and then passing to Herrera, moving behind the fullback, in the now vacant space – which Samuel would have to move out of position to cover the fullback and cause connection problems in the Basel defence. This would create open spaces in central areas that Porto could only use well in the second half. Both Herrera and Torres would also occasionally overload one side of the pitch to try and combine with each other and the winger in creation areas, although once again Basel could keep good local control – with their central midfielders moving ball oriented. Basel would initially press the Porto build up in a 442, with the two strikers – Zuffi moving forward next to Streller. Their strategy was to force Porto wide to win the ball on the wings or to force them to play long. They did this with the first pressing player pressing in-between positions, to reduce passing options, and the other striker man-marking Casemiro. The next wave of pressing would be on the fullbacks – who would be receiving the ball from centre backs either side on or with back to play and pressure – and the man-marking of the midfielders. Early on in the match this strategy was effective and disrupted the rhythm of Porto’s play, which lead to some long balls as a consequence of disrupted connections throughout the team. 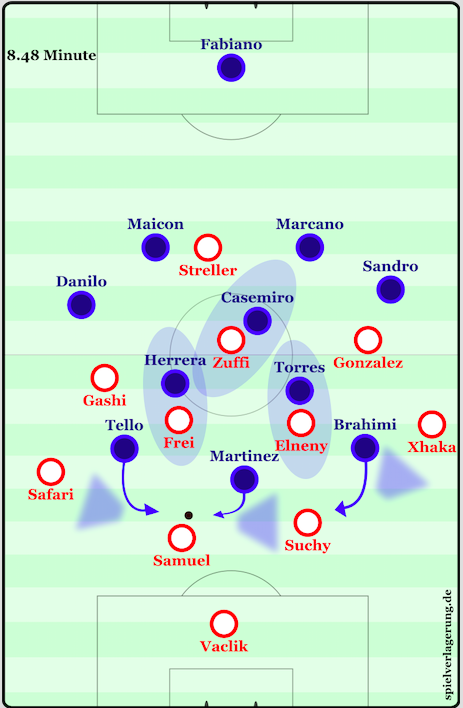 In the possession phase Basel would become 4231 with the fullbacks moving up, although they couldn’t find stability in building due to Porto disconnecting their passing options with their narrow and well coordinated 433 in pressing. Porto would initially begin this pressing central and looking to isolate a centre back to take the ball off or force into a mistake. The wide players would look to cut off passing options from the centre backs to the fullbacks with their cover shadow, Martinez would move in and look to use his cover shadow to block the pass to the other centre back – all 3 players then moving in to press the one centre back with the ball – and both Herrera and Torres man-marking Elneny and Frei to block off all short-medium passing options. When Basel are defending deep in their half they change to a 4411/631 (back 6 with the wide players man marking the high Porto fullbacks). The three central players are very ball orientated and they look to overload central areas numerically in order to try to remain stable. With Martinez not being fantastic in pressure resistance or in tight spaces he struggled to get involved in creation, nor could he take advantage of any early crosses played in from deep positions. swap in position though, as he went onto the right and Tello moved to the left. This changed the wing dynamics of both sides. On the right Quaresma would look to come deep to receive, to feet, the ball from Danilo. Safari would follow man to man and Herrera could then make outside diagonal runs into the space he moved into in the first half and draw Samuel out again, but now he would receive the ball directly from Danilo. This lead to one great chance where Torres moved into the – now open – right half-space and received it from Herrera, before finding a quick pass to Martinez in the box, who wasted a great chance against Vaclik 1v1 in the box. Later on in the half the fantastic Oliver Torres was forced off with an injury and replaced by Neves. Porto now become more 4231 variations with Casemiro and Neves in the double pivot and Herrera in the 10 position – who would now make more depth and direct runs behind the Basel back 4, along with supporting Martinez in the box during crosses. The final change saw Quintero come on for Tello, with Quintero moving into the 10 position and Herrera now moved to the left. A good game and a result both teams will probably be happy with, although perhaps Porto may feel they deserved more. It sets up an interesting second leg, with Basel needing to score at least one in the return fixture in Porto due to the away goal rule. Porto had 63% possession and 15 shots – Basel just 1 shot all game, which they scored. 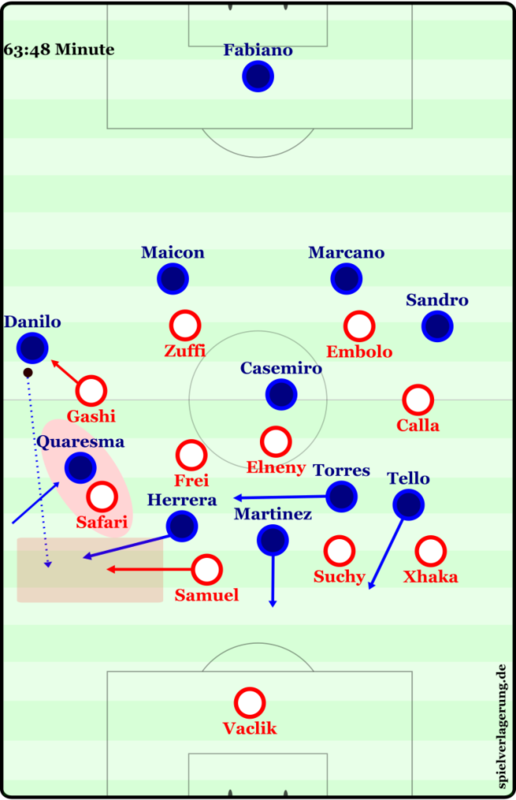 The best opportunities Porto had to score were mainly through set plays – such as: the 2v1 at the near post from the free kick in the 18th minute where the number 4 blocks the Balse defender for the 6 to get a free header, the corner in the 19th minute where they use a blocker again to allow the 6 to have a free header at the near post, and other various corners to the first post where they beat the passive Basel defenders in their zones; who were both not attacking the ball. With better efficiency at home, and potentially a more open Basel team, Porto should be able to reach the next stages of the Champions League.